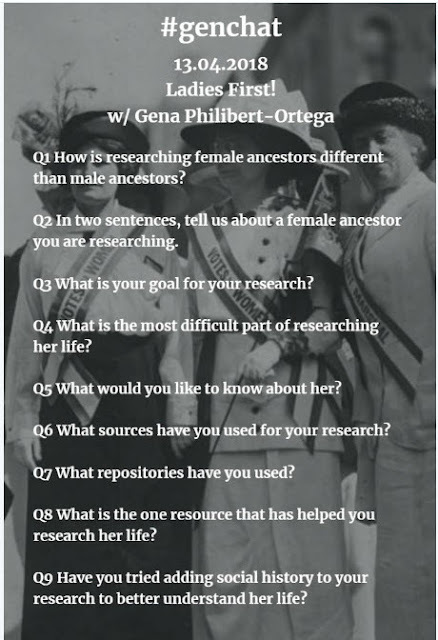 Gena's Genealogy: Did You #genchat #LadiesFirst? 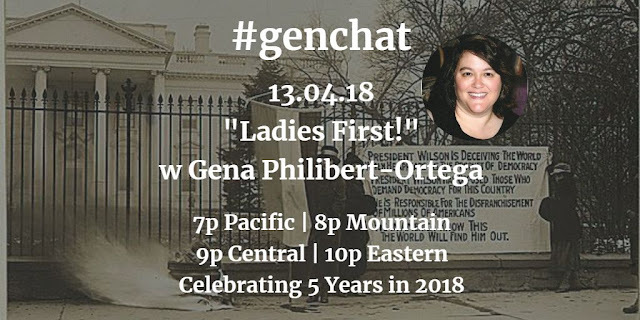 Last Friday (April 13th), I had the honor of being a guest on #genchat. Have you participated in #genchat? GenChat is a Twitter chat that happens every other Friday night. Co-hosted by @geneapleau & @leprchaunrabbit, a topic is discussed with questions being asked by the hosts and answers supplied by all in attendance. Because it is all text/images, and the information comes at a quick speed, it can take some getting use to. 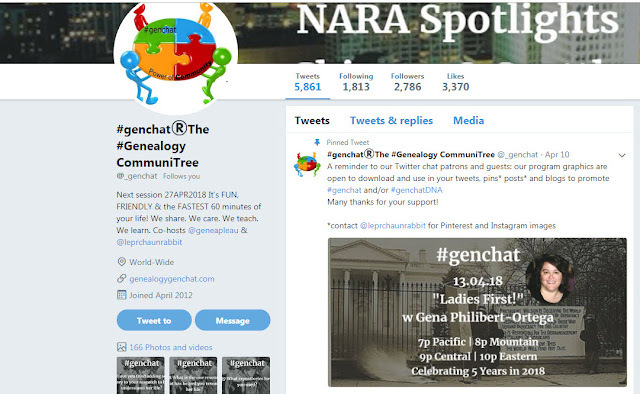 But the beauty of the chat is that you can use the GenChat hashtag (#genchat) to go back and read the chat at your convenience. What can you expect to learn during #genchat? 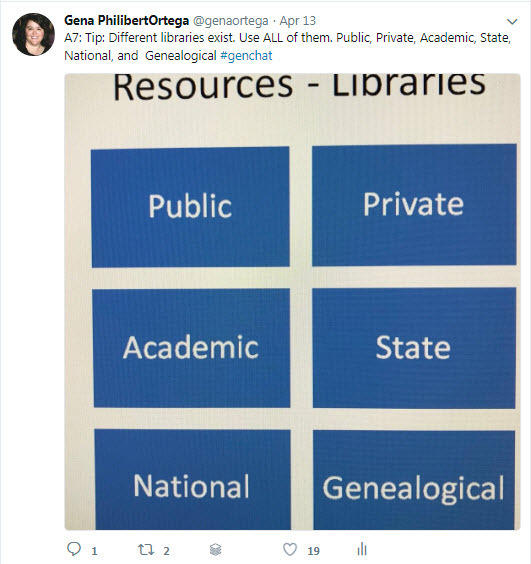 Everything from repository holdings, to helpful websites/collections, and tips from other researchers. It's an important service that is provided absolutely free. If you want to participate in #genchat, you must have a Twitter account. 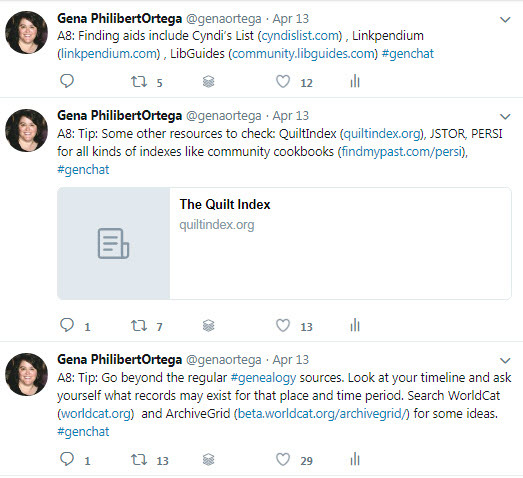 Once you have an account (which is free), I recommend following the Twitter account @_genchat and the account of the two hosts listed above. And you can follow me (@genaortega). 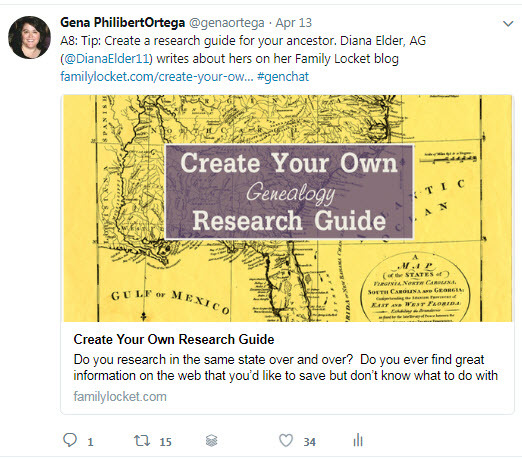 Twitter is "cataloged" by hashtags (a pound sign and a word or words) so make sure to search on #genchat and #genealogy to find those tweets that can be beneficial to your research. 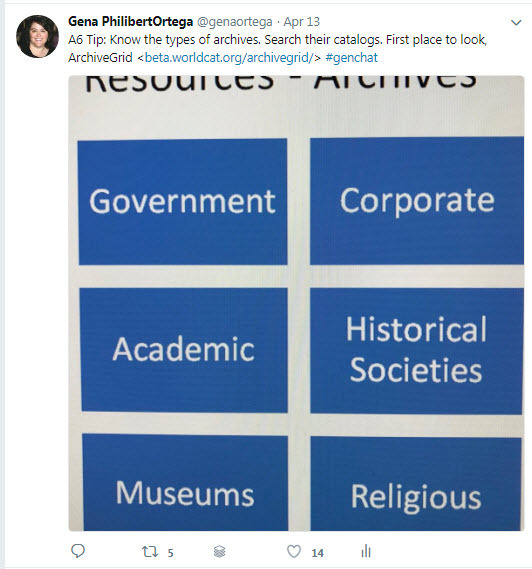 Just to give you a flavor of what we discussed, here are some of my questions and tips. This is not everything I shared but it provides you an idea. Thanks to everyone who participated in #genchat. I had a great time and hope you found it beneficial. Special thanks to the #genchat hosts (@geneapleau & @leprchaunrabbit) who invited me to participate.